You can never be too careful when clicking on any links or attachments sent via email, even if the sender purports to be someone from an established and well-known company. MailGuard intercepted an invoice email scam which uses multiple display names of legitimate companies on Thursday morning AEST. 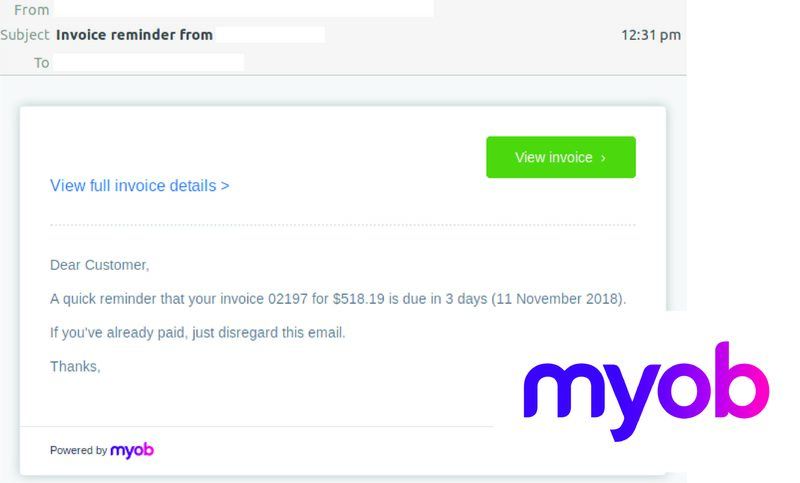 The email included an invoice purportedly issued by MYOB. The well-known accounting software company’s logo and branding were incorporated by cybercriminals within the body of the email. Sent from one of many hijacked company names, the email informs users that their invoice in due in 3 days. A link is provided to view the invoice, which leads to either an offline webpage (404), or a blank page. MailGuard suspects that these pages host either a phishing page or a malicious payload. The emails actually come from multiple compromised email accounts. Why are brand-impersonation scam emails so popular? There are many factors. But in short, cybercriminals prefer to rely on the hard work of others. By targeting popular brands, recipients are more likely to have a relationship with the company being impersonated. That’s an instant foot in the door. In this case, cybercriminals used familiar display names to send hoax invoices supposedly generated by MYOB. Here’s some more information on why online criminals hide behind trusted brands. 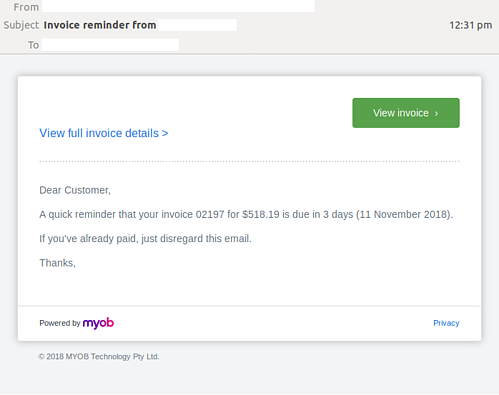 MYOB – and the companies that use this software – are innocent parties in this invoice scam. But it’s not just direct customers at risk. Because the fraudulent email has been distributed so widely, it widens the net with regard to the number of people susceptible to the scam. All that criminals need to break into your business is a cleverly worded email. If they can trick one person in your company into clicking on a malicious link they can gain access to your data.